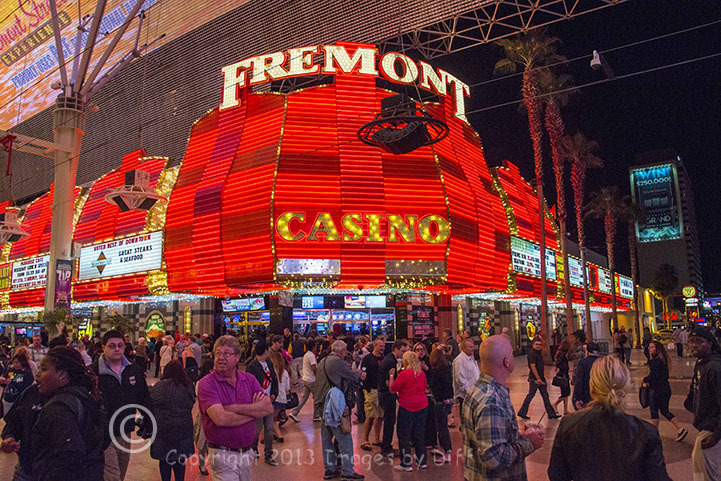 click photo to enlarge One of our favorite places to go in Vegas is Freemont St.. 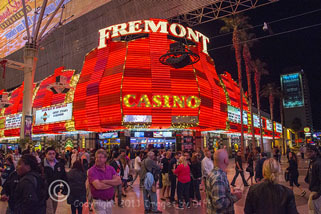 It is interesting how much it has changed over the years and it really comes alive at night. They have zip lines you can ride that are way up in the rafters and it is fun to watch people go flying overhead. There are a lot of people out and about during the day but at night it gets crowded. 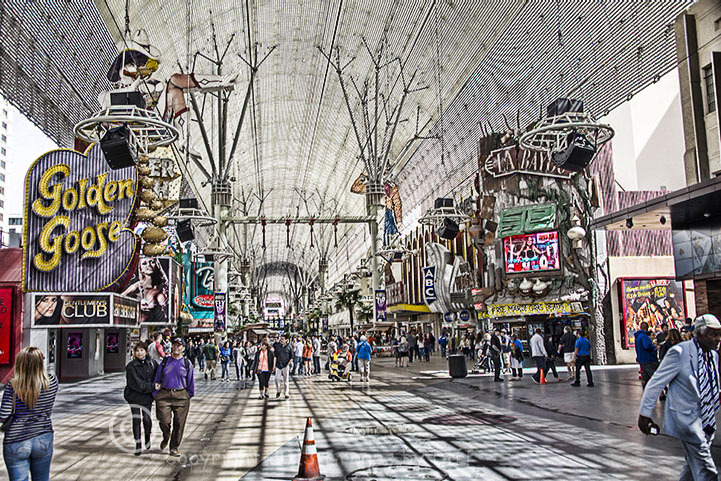 There will be people dressed up like the rock band Kiss, or like one of the super heroes or Vegas show girls at night for you to take your picture with them.. Of course you have to give them money. click photo to enlarge Another newer area nearby on Freemont St., near the Experience, is Container Park. 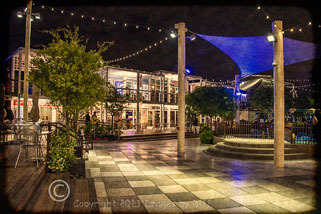 It is made of repurposed shipping containers and has mostly Boutique shopping and some restaurants. 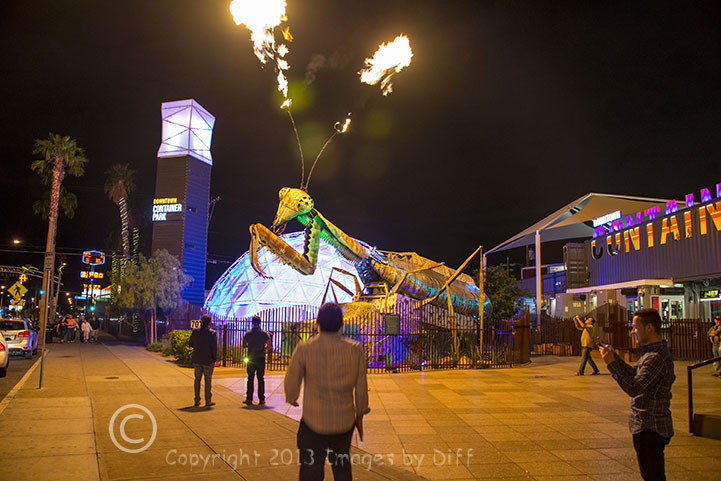 There is a large metal praying mantis sculpture out front of Container Park. It plays music and about every 150 to 30 minutes at night it shoots fire out of it's antennae. Apparently the guy inside it likes to watch and catch unsuspecting people off guard. We were waiting to see it and photograph it. A group of young adults came out of container park and when he started the flames it startled one guy so much he fell to the ground. Before coming to container park the artist towed it to Burning Man. It has been housed at container park since 2012.
click photo to enlarge The evening light show at the Freemont St. Experience happens once an hour on the hour. 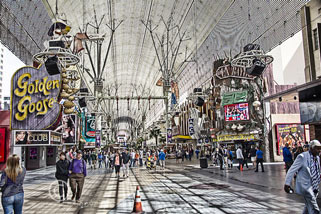 They turn off all lights on the Casinos and bands that are playing stop so you can see the overhead light show. 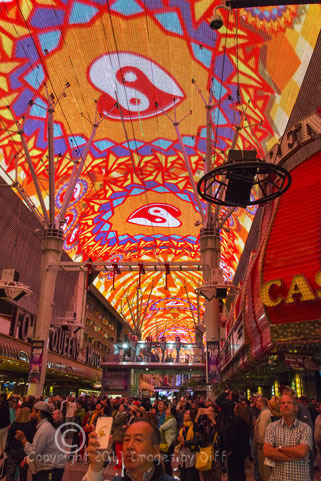 It is quite an incredible light show with 12.5 million LED lights and a sound system rated at 550,000 watts of power. This show needs to be seen and heard to be believed.